Food!We took enough pictures of food that it deserved its own write up. 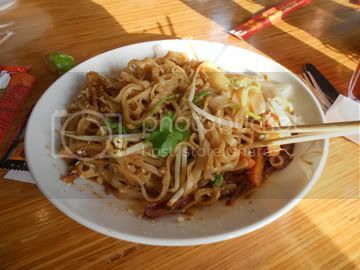 We took enough pictures of food that it deserved its own write up. 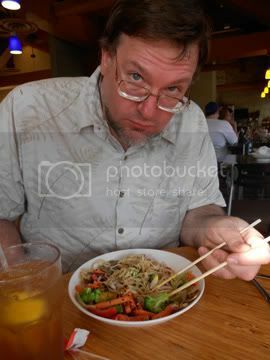 I miss the Noodles & Company (http://www.noodles.com/) Good food and reasonably priced, darn it. 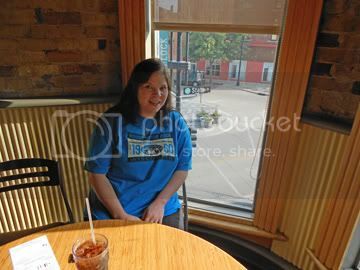 We went there twice and got the same seats because the view is as good as the food. It’s one of the triangular shaped, narrow buildings on the corner of State Street. So it’s three floors high but one of the floors only seats maybe six people. We grabbed the third floor corner table because it was the perfect view down State Street and watched the pedestrians, trying to figure out if they were conventioneers or college students or tourists or wackos. 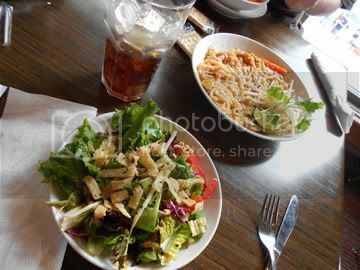 The food was amazing – thanks to friends who share I had their Pad Thai, curry, Indonesian Peanut Saute, penne rosa, tomato basil bisque, and a great salad with black sesame seeds instead of croutons. Oh, and really good marshmallow rice krispee treats. They had honey for the tea and they had cute take-out boxes based on the traditional Chinese restaurant take-out boxes. 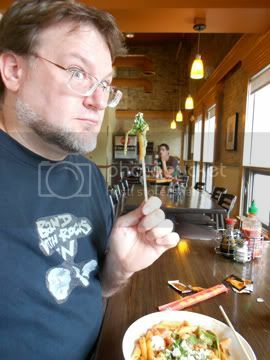 I could have eaten there every day. Another night we ate at an Italian place we spotted from the Noodles & Company window. 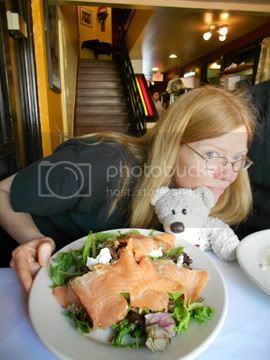 I got a yummy green salad with salmon, goat cheese, and sugared pecans. 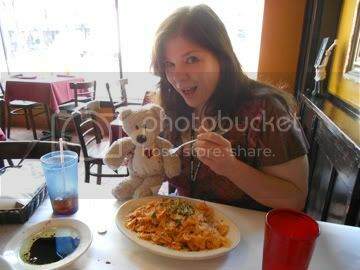 Monkeys got ravioli and Toaster got their signature dish – lobster alfredo. Everything was really good. Due to time constraints and weather we ate at the hotel twice, once for lunch and once for dinner, and it was actually pretty reasonably priced and delicious. For lunch we tried various sandwiches. For dinner I had an amazing sashimi tuna dish with a fried wonton and noodles and an amazing salad again with goat cheese. 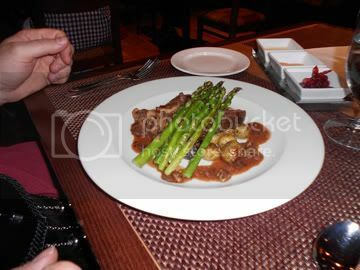 Monkeys got a steak with amazing potatoes, mushrooms, and asparagus and three signature sauces on the side. They also had a bread bowl with fancy breads and crackers and herbed butter. On Sunday they were having an Arts Festival around the capital building, so we took a side tour to walk around all the booths and get fair food. Monkeys and Toaster got corn dogs and I got a gyro. On Monday we at lunch at the con suite – free! They had lunch meats and cheese and a veggie tray. I made a peanut butter sandwich. It was a lot nicer than the Dragoncon hospitality room, but they only had to worry about the potential of 1000 people as opposed to 60,000. 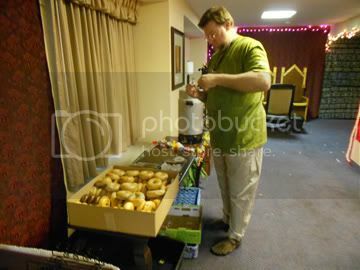 Speaking of the Con Suite, through the convention we appreciated their breakfast every morning – huge variety of bagels including jalapeño, yay! And we stopped in for sodas (including IBC root beer!) and coffee throughout the day. The Seamstress Guild threw parties there every evening. The Quirm party served fancy cheese dishes!! I especially liked the brie and almond torte and the brie and dried cherries torte. The other nice thing about the hospitality room was that you could visit with other conventioneers and talk about their experiences at the convention, where they are from, etc. Awww - is the food gone?